It’s a drain down poll! With the recent freezing weather conditions it’s vitally important that you drain down your static caravan or lodge to prevent costly damage to your pipes and taps. So, in our recent community poll, we asked readers if they’d drained down for winter. With more than 300 votes, a massive 83 per cent have already drained down their unit. 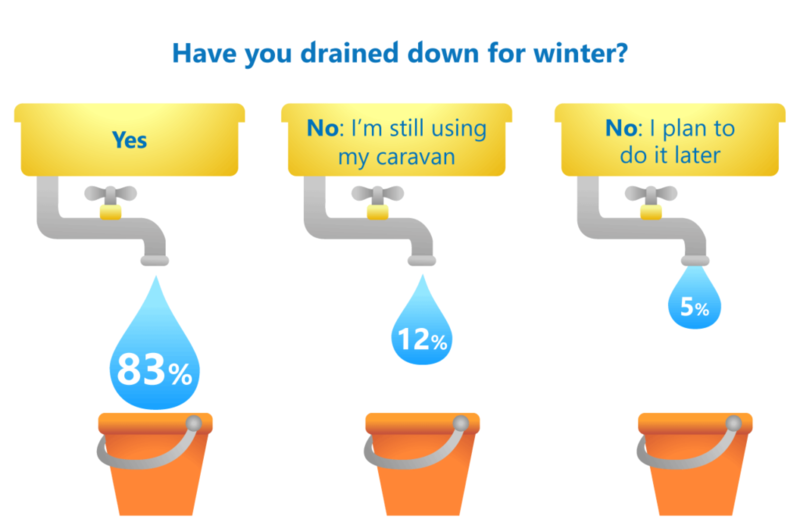 A further 12 per cent of owners are still using their caravan so haven’t drained down yet. Just five per cent of voters said they planned to do it later. It’s a timely reminder to these owners that their static caravans and lodges are vulnerable to the cold winter weather and should their caravan pipes burst, or there is damage to the boiler and they haven’t drained down, then their insurance cover may not be valid. It’s a condition of a Leisuredays static caravan and lodge insurance policy that the caravan owner must drain down between November 1st and March 15th, if you’re not using your unit and your park is closed. See further details on our winter weather precautions page. Since you had your competition for a floe draindown compressor which I didn’t win, I have purchased one with your discount thanks very much and I am very impressed with the setup it’s a peace of mind knowing that the system is drained down completely. Just a word of advice regarding drain down. Modern thermostatic shower mixer valves have non-return valves in the hot and cold feed connections. This means that water will not drain out of the shower valve, and may not drain out of the hot and cold feed pipes either. I always take mine off to ensure I can empty the fitting, and to allow the feed pipes to drain, before re-fitting it so I don’t have to do it at the beginning of the next season. I know folk on my site who have used a so called professional to do the draindown, and they haven’t done this, resulting in a frost damaged shower mixer. Agree totally. My mixer will not drain out. I always take it out and take it home for the winter!! Thanks for sharing this advice Martin. Agree with Mr.Naylor fitted the Floe 868 to my static and my sister-in laws. Press switch to turn the unit on and it takes about 5 mins to drain down. This will make sure that the shower unit is drained as well. and when you leave 5 mins and it’s done.